Well can you believe it’s Thanksgiving already?! I blinked and November’s passed me by. 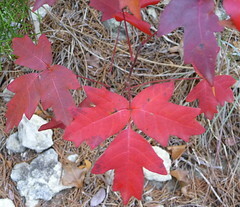 By this time of year it finally starts to look and feel a little bit like fall here in Austin. Time once again for my annual search for something approaching fall color. Last weekend I got out on a hike on the Pather Hollow trail near here. It’s a short but peaceful trail that wanders along a creek. Though it’s tucked in amongst a heavily populated area of homes, you’d never know it. While not quite as spectacular as the change of seasons I remember from ‘back home’, I managed to find some interesting displays of color. 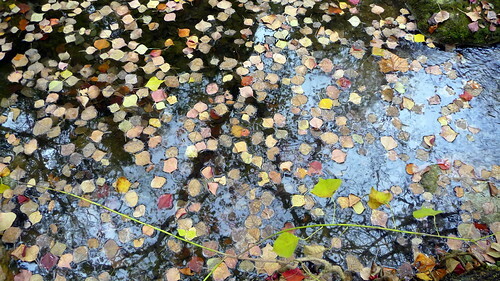 My favorite picture of the bunch is the one below of the leaves floating on the water. A real mosaic of colors.